Boston’s massive reconstruction of the Longfellow Bridge began this month. Over the next three years, traffic will be severely restricted, bicyclists mostly accommodated, and rail traffic mostly maintained across a major link in the transportation system which carries 100,000 transit riders as well as several thousand bicyclists and pedestrians across the Charles River (and some vehicular traffic, too). In late June, I took a baseline, pre-construction count of morning, inbound traffic across the bridge. With the new traffic configuration in place (an inbound bike lane, a travel lane, a pylon-lined buffer and an outbound bike lane, plus the sidewalk) I decided to take a new snapshot of the bridge traffic. 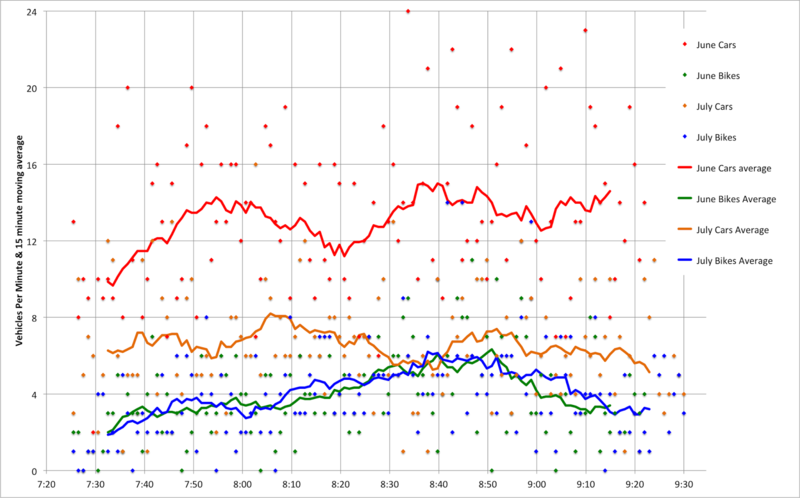 Had traffic declined with fewer lanes available? 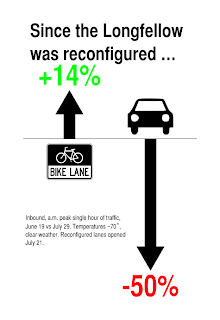 Are cyclists shying away from the new configuration? 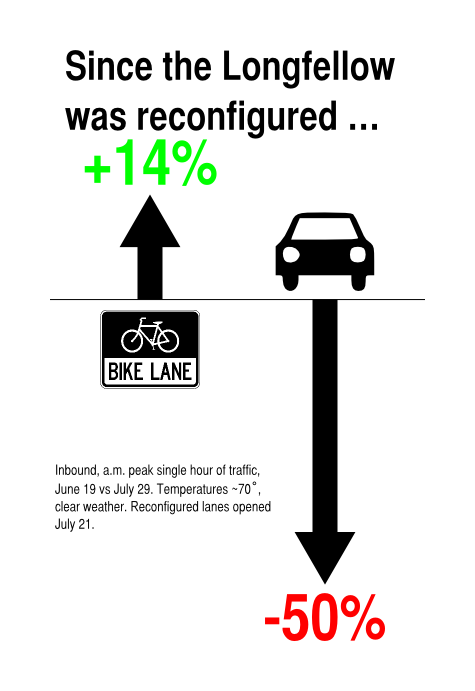 Bicycle counts stayed about the same (they actually rose, overall, and the peak hour saw 308 cyclists, an increase 14%). Vehicle counts, however, showed a dramatic drop, declining by 50% from 840 to 400 during the peak hour of use! It’s interesting that this is not due, necessarily, to restricted capacity (the one lane of traffic didn’t back up beyond the midpoint of the bridge at any time when I was counting, although the afternoon is a different story) but perhaps the perception of traffic, and the fact that the single lane reduces traffic speed quite a bit. No lack of praise should be given to MassDOT for this iteration of the Longfellow traffic pattern. The bicycle facilities are, if anything, improved over the bridge before, especially considering the much lower vehicular traffic speeds and volume. And there is no lack of cyclists—even on one of the quietest weeks for traffic midsummer, there were more bikes than a day with similar weather in June. Between 8:30 and 8:45, there were actually more bicyclists crossing the bridge than vehicles. Pedestrians of all types outnumber cyclists (although this includes both joggers and “commuters”—as defined by me—in both directions). 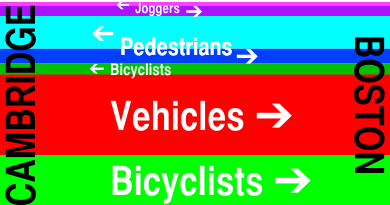 The flow of “commuting” pedestrians is a mirror image of bicyclists. There are four times as many Boston-bound cyclists as Cambridge-bound, but more than twice as many Cambridge-bound Pedestrians as Boston-bound. (There are fewer joggers, but they exhibit a preference towards running eastbound across the bridge, differing from the other foot traffic.) Overall there are more bicyclists going towards Boston and more pedestrians towards Cambridge. While 24 Hubway shared bikes accounted for only 5% of inbound bicycle trips, the 20 outbound Hubways made up 18% of the Cambridge-bound bicyclists.